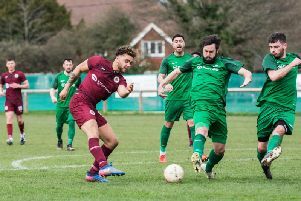 LANCING Football Club suffered their third successive defeat on Tuesday when they lost at St Francis, which leaves them with just one win in their last eight league games. In the fifth minute, Pat Rose’s shot took a deflection to loop over Lancing’s youth keeper Dan Neale, deputising for the unavailable Joel Harding, to give the home side the lead. A superb cross with the outside of the boot by Rangers’ Tom Barnes left Josh Perry a free header and he dispatched comfortably nine minutes later, but Lancing came up with a swift reply just two minutes after that. Right-back George Fenton did well to force Rob Gordon into a save and Dan Turner scored from the rebound. Under-strength Lancing still had some familiar names in the line-up, including Whitehawk’s Paul Armstrong, making his debut in a bid to get some match fitness. It was fairly competitive although Rangers looked the more dangerous and Branden Fugl had a couple of good chances in the last eight minutes of the first half. He dallied too long on the first occasion, but was then unlucky to be inches wide after a surging run through the middle. There was still little in it after the break but Lancers had a strong penalty appeal for handball turned down on the hour and St Francis immediately broke and made it 3-1. Brannon O’Neill’s strike beat Neale low to his right to virtually settle the issue. After that, Rangers could have had more than just another Perry header on 65 minutes which took it to 4-1. The goal came from Charlie Pitcher’s corner and made it five in two games for Perry, who had mustered only two in the previous nine games. Lancing boss Martin Gander said: “It wasn’t a 4-1 game, but it’s no good feeling sorry for ourselves. Little things which went for us last season aren’t going for us this season.